Home » SCRIBNER, ARTHUR H.
Entering the publishing house his father helped found in 1846, (renamed Charles Scribner's Sons in 1878), Arthur became vice-president of the firm in 1903, and president in 1928, succeeding his brother Charles, who remained chairman. 1915, Illinois. 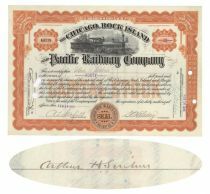 Stock certificate for 40 shares. Orange/Black. Vignette of a steam locomotive at top center. Issued to and signed on verso by Arthur H. Scribner (1859-1932). Publisher. Extremely Fine. Punch cancellations not affecting Scribner's signature.